Notes about the garden and its transformation. 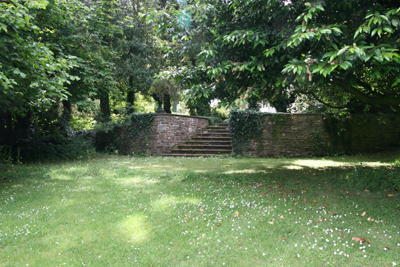 Large luxury house for sale with extensive gardens and paddocks. All the walls around the garden were crumbling, these have been painstakingly rebuilt. New walls were built on old foundations and flights of steps leading to different levels were built to create both interesting features, but also to give a sense of timelessness. The little potting shed was built to echo the traditions of the past using old original windows, a stunning antique chimney and other details making a solid and warm place for the gardener to ‘potter’ and have a cup of tea in comfort. There is a working fire in the potting shed. The stone potting shed has been rebuilt using reclaimed materials. A log burner keeps the gardener warm in the winter. The walls and stone steps are all rebuilt in local stone. A Georgian house with formal gardens for sale. The small formal stone pond and paved area, designed to create a colourful, yet low maintenance garden. The four Bay trees are now so large that very little grows under them. We therefore covered the beds with a membrane to stop weeds growing and covered with large cobbles that we discovered when we dug the trenches for the drains at the studios. 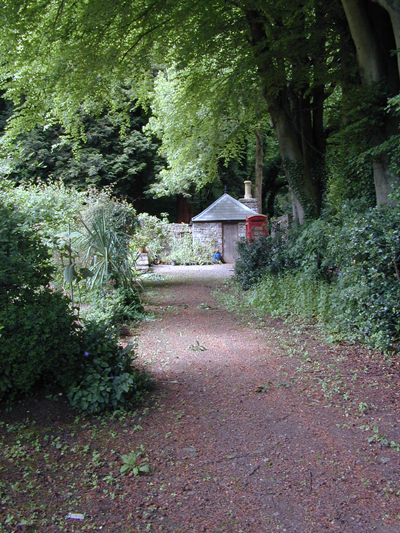 The original atmosphere of this part of the garden could be re-created if the bay trees were kept clipped, but we liked the simplicity of the trees and stonework underneath. A box hedge has been planted around this area giving it a more formal structure in contrast to other wilder parts of the garden. 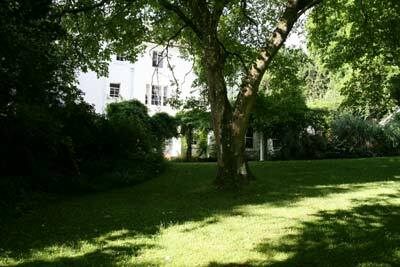 This is how this part of the garden looked before the bay trees grew so big. 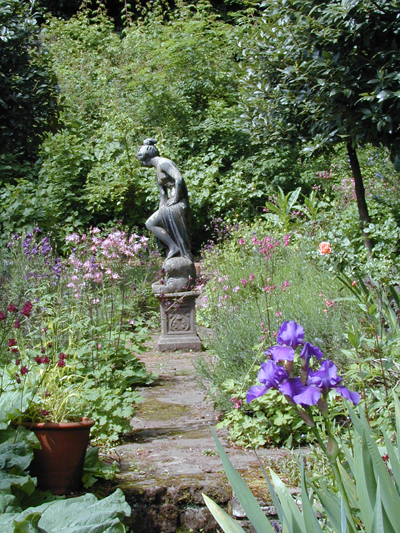 The bathing lady amongst the aquilegia and iris. The Bay trees are now almost touching over the top of her head. 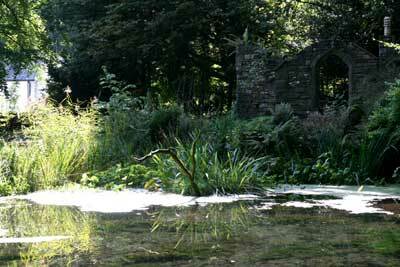 The big pond and the ruined chapel. This folly was built as a romantic place to entertain friends with al fresco dinner parties – there is a fireplace where a barbeque can be set up or just pile on logs and enjoy the warmth on a summer evening. 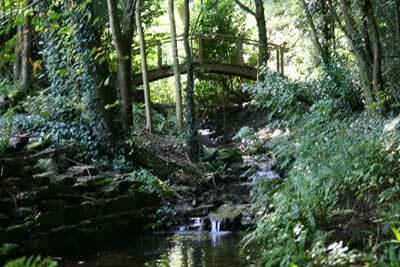 In the wood part of the garden next to the chapel folly is the stream that feeds the pond. Waterfalls and small pools in between lead to the main pond and a Monet inspired bridge spans the stream on the boundary of the property. Varieties of moss are beginning to spread over the stones and paths – creating an interesting feature in this shady part of the garden. This idea was inspired after we visited the famous moss gardens in Kyoto. A combination of the traditional simplicity of a Japanese Moss garden interspersed with English bluebells and snowdrops – a cultural mix, but nature decides what it wants to grow! View of the Blorenge mountain from the pony paddock. 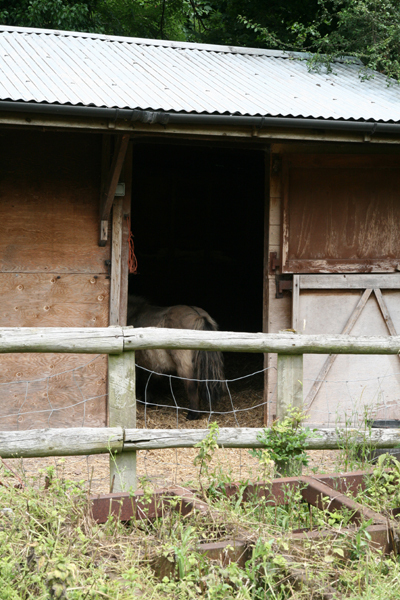 Wilfred (our blind rescue Shetland pony) in his stable. This block of stables consists of four loose boxes (one used for tack etc.) there is a very large shed and an open sided lean-to where we store straw and hay. 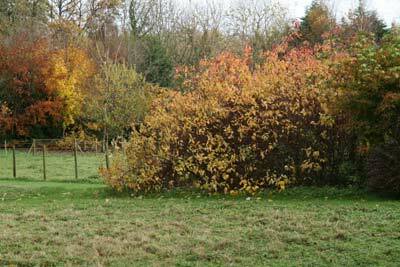 A cluster of shrubs between one of the paddocks and the area we have turned into a wildflower meadow. Acers, Dogwood and berberris. One of my favourite trees is the Pawlonia with its amazing foxglove flowers and dusty bronze flower heads and seed pods. 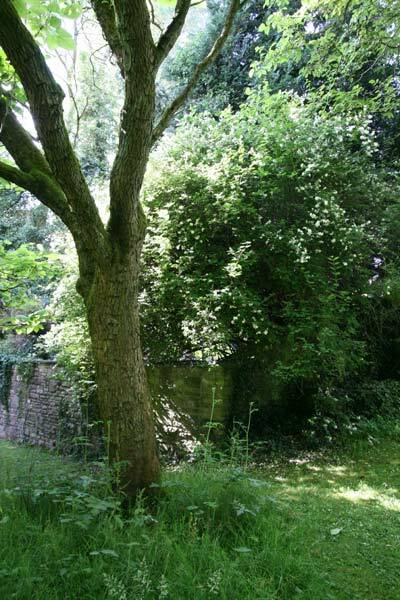 Another less common tree is this Catalpa grown from seed taken from the huge tree in Monmouth – grown by the previous owners as were the three walnut trees – now at least 50 years old. In front of the house we have a terraced wall where we planted these hardy fuchsia grown from cuttings taken during the first year that we lived at Llanfoist House. 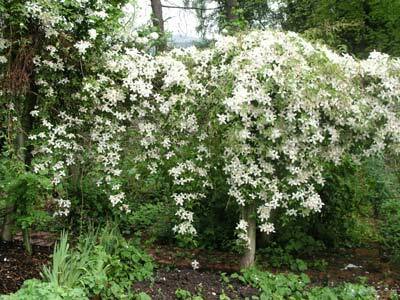 They often survive well through the winter, but if they are damaged in a hard winter they just have to be cut down to about 9 -12 inches and new growth appears in Spring and in no time they are tall again and are smothered in these delightful flowers. 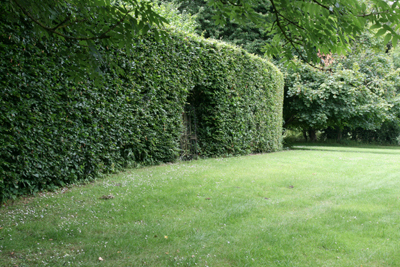 The beech hedge on the big lawn side – showing the arch where the gate is. 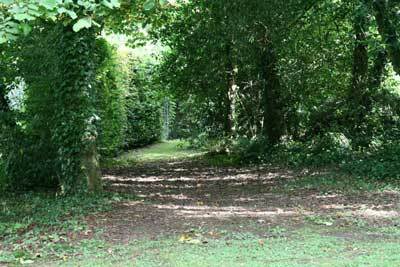 The Beech walk – the other side of the beech hedge – a lovely shady walk. 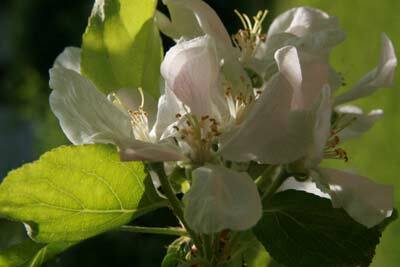 There are three major Walnut trees in the garden which were planted from seed by the previous owners. There are younger ones in the lower part of the garden between the garden and pony paddock – these are beginning to bear fruit. This is a fairly new feature created in 2009. We were greatly inspired by the famous moss garden in Kyoto and vowed to create a moss garden in Llanfoist. 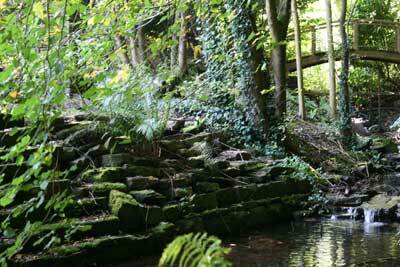 The moss is now developing well and the water feature becoming more natural looking. It was difficult to see exactly what the garden consisted of when we first moved into the house. 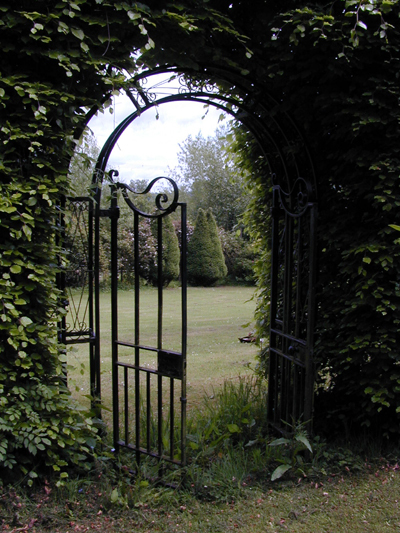 An atmosphere of ‘The Secret Garden’ prevailed and over a period of several months we gradually found walls and steps and paths that lead nowhere. One beautiful curved wall is still as sound today as it was when we discovered it six months after moving into the house. Brambles clambered up into the old apple trees, terraces that once had been a productive vegetable and fruit garden appeared and once the ground ivy, vicious nettles and other invasive weeds were comparatively tamed we began to find exciting treasures such as an old asparagus bed, trained redcurrants and gooseberries. This part of the garden was temporarily used as a small paddock for our daughter’s pony – fortunately a small field came up for sale and the pony was moved into the field and we took over this part of the garden for our vegetables. 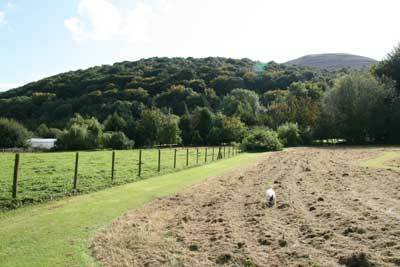 The ground is light and very easy to dig having been cultivated for hundreds of years – but it was hungry and we applied masses of compost and horse manure to liven it up. Some things grew brilliantly, but others were less successful – sometimes due to the soil or the shade of the trees and sometimes just our own ignorance. 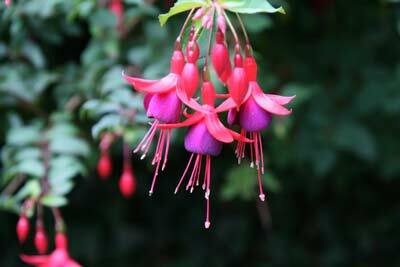 Over the years the garden has been transformed into a mixture of formal and informal planting. A solid stone wall has been built around two sides and in one corner a classic potting shed with old leaded windows and inside a fireplace for the comfort of the gardener. 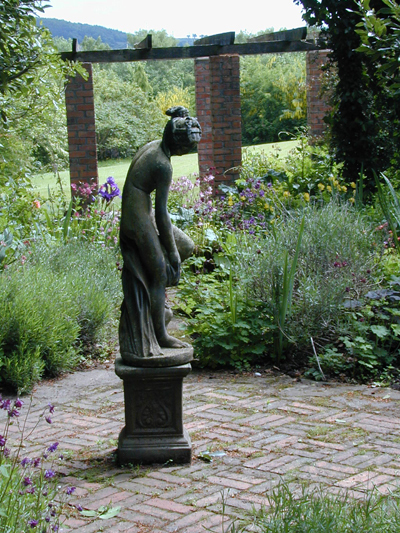 A formal pond is the focal point of this part of the garden, this stands out of the ground giving a seating place from which the wildlife in the pond can be observed. We did have some magnificent koi carp in this pond, but one day they all disappeared and the signs indicated that an otter had enjoyed a very expensive gourmet meal. this was confirmed when a neighbour sent through a picture of the otter eating fish from his pond. So this made us decide to keep both ponds as wildlife conservation areas and let the frogs, newts and other creatures enjoy the habitat rather than introduce exotic species. If you have ever watched the antics of a stickleback guarding his nest – well you just have to imagine what a pleasure that is. The large pond on the upper terrace is fed by a part-time stream. This was just a gloopy muddy hole when we moved in and was one of the first projects that we undertook. But digging out brown overcooked porridge was a challenge and eventually several years later the whole pond was extended, lined and pumps put in to circulate the water to the boundary of the property allowing us the pleasure of a summer stream as well as the wonderful roaring water of the winter. Despite very heavy downpours, this stream is now always capable of contending with the water that comes from the mountain behind. 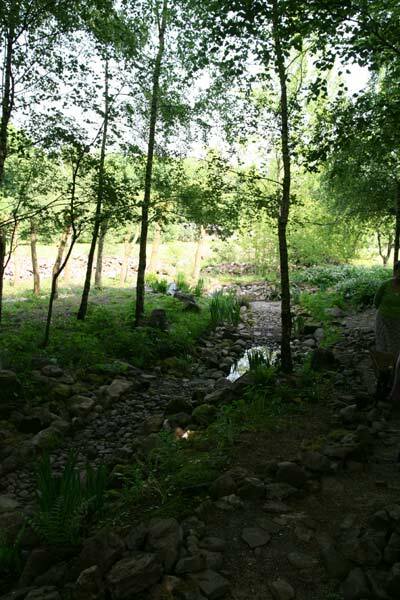 The stream is lined and a ‘Monet’ inspired bridge spans the boundary entrance of the stream – intended to lead to the upper path that runs around the steep bank above the pond and stream. 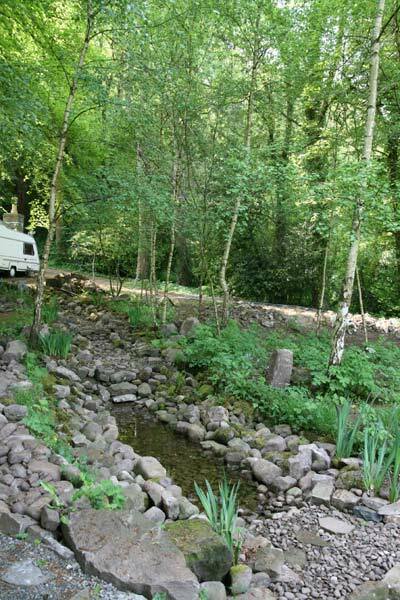 This pond has a rich and diverse variety of plants and wildlife. A branch from the oak tree provides a convenient kingfisher park and wild duck (including Mandarins and Carolinas as well as Mallard) use the pond at various times of the year. Being members of an eccentric organisation ‘The Folly Fellowship’ and having been brought up on the edge of the grounds of Stowe School – the concept of building our own folly was not as crazy as it seemed to some people. Over the years many really magnificent buildings have been demolished and we start collecting and buying stone from these demolition sites. 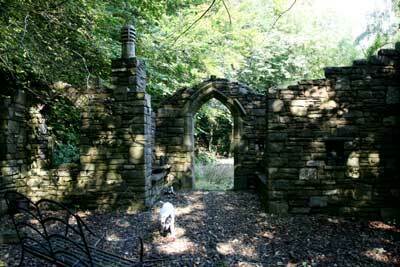 Having aquired a lovely Gothic door surround in stone and some mullioned stone windows we decided to build a ruined chapel. This is fabulous for al fresco dining – the fireplace makes an excellent barbeque or outdoor fireplace for a summer evening and nightlights floating on the pond make a romantic setting for a party. There was very little in the garden in the way of ornamental shrubs and trees and from the very first few months many species have been added. 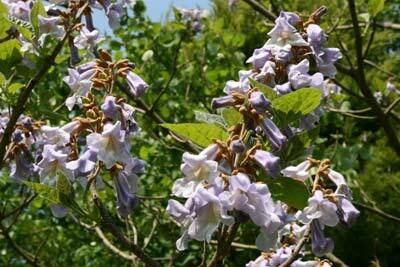 It is an indication of our age and the time-span that we have spent here when we see a Wisteria grown from a cutting from the original plant in the front of the house – has now clambered right up to the top of the mature beech trees. It is a glorious sight seeing the beech tree festooned in these fabulous blooms. As I think of the various plants that have been added to the garden – I will list them and perhaps make a map showing where they are. Magical trees such as Pawlonia are now mature enough to bloom.